With an epic workout comes the all important fuel that follows. Here are 5 tips for post-workout nutrition. Rehydrate. Water and electrolytes are an important part of pre-, during, and post-workout fuel. Make sure to consume plenty of water and add a pinch of pink salt and lemon or a nuun tab. Also, incorporate fresh fruit, celery, and/or dulse flakes into your post-workout recovery. Dulse flakes can be tossed into a salad, smoothie or stir fry. Fuel your body within 30-60 minutes of your workout with a carbohydrate to protein ratio of 4:1 (shoot for about 30-40g. of carbohydrates and 10-15g. of protein). 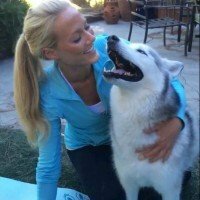 This is prime time to replenish your glycogen stores, and promote muscle repair and recovery. About 3 hours post-workout, follow up with a hardier dish of greens, beans, and whole grains. Eat lots of fruits and vegetables. Fresh is best, because of the water, electrolyte, and enzyme content in fresh produce. Frozen is great, too! Enjoy some healthy fats. Chia seeds, flax seeds, hemp hearts, avocados, and walnuts are all champs of the healthy fat category. First things first, remember to rehydrate. 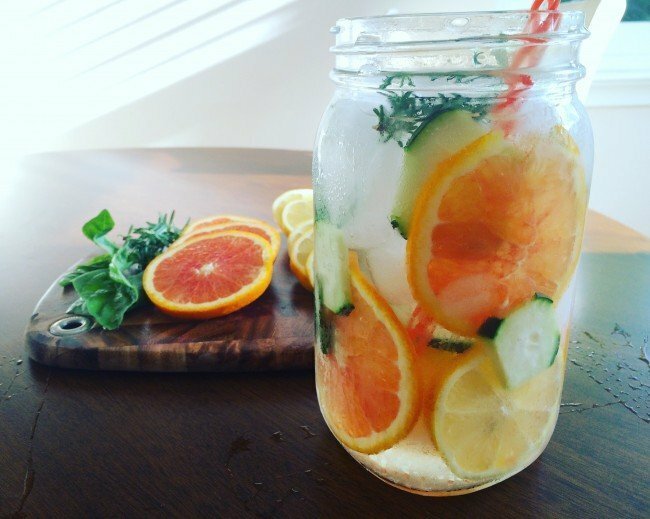 Just like you did before your workout, this Cucumber and Citrus water is an excellent source of H2O, flavor and electrolytes. Scrub and rinse the cucumber, lemon and orange under warm water. Slice fruit and combine in a large glass or metal water bottle with cold, filtered water, ice (optional), fresh herbs, and salt. Note, I squeeze the juice from the lemon/orange wedges to make the water extra citrusy. Then add the slices for additional flavor and color. Enjoy all day and refresh with new fruit/herbs as you drink. Now, sink your teeth into one of my all-time favorites: Sweet Potato Toast. Great if you’re looking for a grain-free, gluten-free, filling alternative to traditional toast. It’s also easily customizable – you choose savory or sweet. 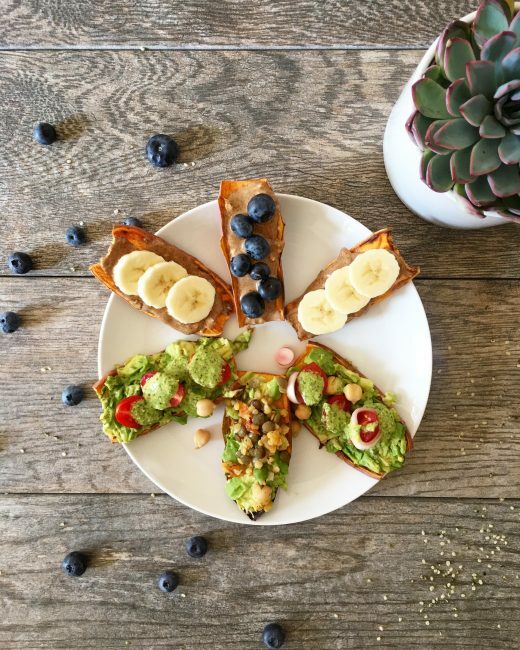 Get your healthy fats, protein and more with nut butter, sliced banana, avocado, sliced tomatoes, hemp hearts, fresh berries, pinch of salt, hot sauce, and any other toppings that float your sweet potato toast boat. Scrub and rinse sweet potato. Pat dry. Leave peel intact. Slice both halves, lengthwise, into ¼ to ½ inch thick slices. Toast slices using a toaster or toaster oven, on the high setting for 1-2 rounds or until edges are lightly browned and center is tender. After an especially grueling workout, this Blueberry Granola Acaí Bowl offers a refreshing burst of flavor alongside greens, carbohydrates, protein and fat. Combine smoothie ingredients in a high-powered blender and blend until creamy and smooth. To thin, add more plant milk. To thicken, add more banana. 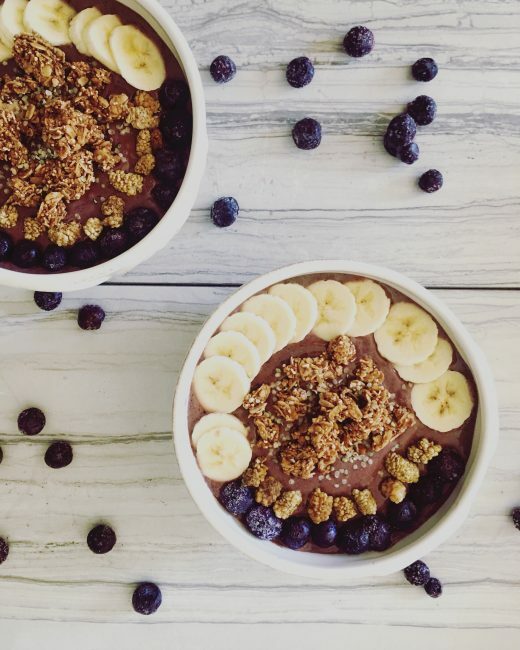 Pour smoothie into two serving bowls, garnish with toppings and enjoy! For a superfood bonus, add maca root powder, goji berries and/or spirulina. Soak cashews in boiling water for 15 minutes (in a tempered glass container – Pyrex works), drain and rinse. In a food processor or high-powered blender, combine cashews and remaining ingredients. Blend until creamy and smooth. Wash, rinse and spin greens in a salad spinner. Wash, rinse, slice and dice remaining veggies and fruit. 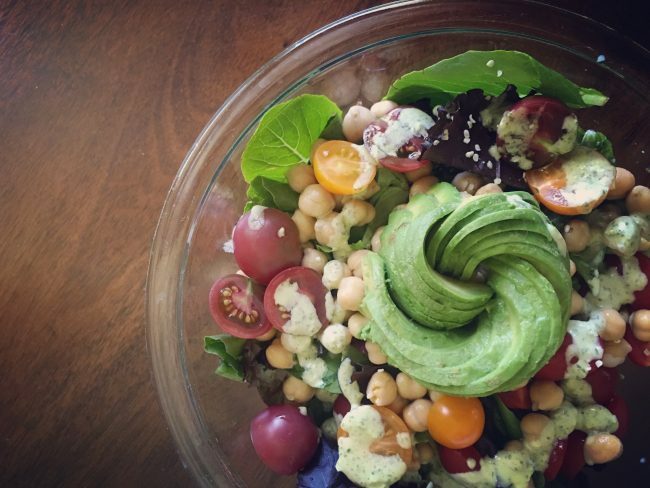 In a large bowl, combine all ingredients, toss and slowly incorporate desired amount of dressing. Go light at first, thoroughly mix, then add more as needed. The greens are just a guide. If you prefer other greens, go for it. Just make sure to thoroughly wash and spin before eating. I suggest cooking your beans (or buy canned) and grains/potatoes ahead of time. That way you can just throw your salad ingredients in a bowl and enjoy. If you’re making this ahead of time, put the heavy ingredients in the bottom of the bowl first, then top with greens. Incorporate dressing right before eating, otherwise you’ll have a soggy mess on your hands. Another stellar dish is this Napa Chickpea Salad. 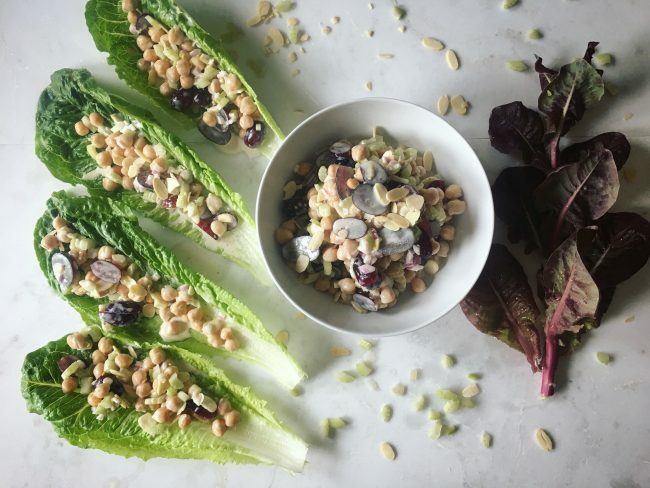 It incorporates plant-protein, fiber and complex carbohydrates from the chickpeas, fresh greens (romaine lettuce), healthy fats from the almonds, and just the right amount of sweetness from the grapes. In a large mixing bowl, add chickpeas, onion, celery, grapes, and almonds. Combine sauce mixture with ingredients in large mixing bowl and toss until well incorporated. Cover and chill in the fridge for about an hour before serving. Enjoy as a wrap in romaine lettuce leaves, on whole grain bread, or on a bed of leafy greens. Written by: Coach Jentry on June 22, 2018.